Clapperless bells are sometimes known as faerie bells. These are made in India, and they give this piece a gentle fey quality as they softly jingle against each other. 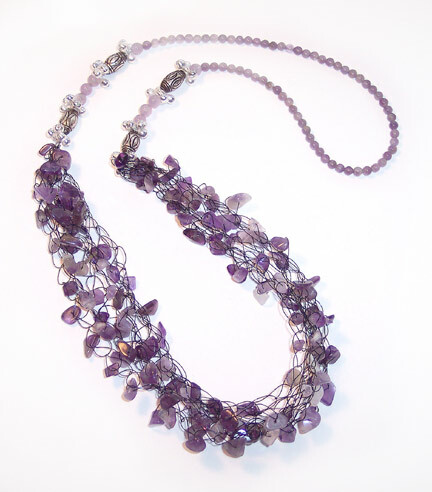 Combining them with crocheted strands of lavender amethyst on wire makes for a necklace with a lot of natural movement. I suggest crocheting a small sample with your colored wire and stone chips before proceeding with the full piece if the finished length is important to you. I found that 12 inches of wire reduced to approximately 3 inches when crocheted, but your results may vary greatly due to the hook size you are comfortable with, the tension you use, and the chip size. Adjust my instructions to yield the length you desire. I used 18 inches of chips and ended up with a crocheted piece 80 inches long. 1. Thread all your chips onto the colored wire. Starting 4 inches from the end of the wire, begin to crochet a simple chain, adding a chip to every other chain. Leave a 4 inch tail on the other end too. 2. Fold your chain into strands of approximately equal length and use the loose wire end to anchor them together. I folded mine into six lengths, so I had to cut another short piece of wire to wrap the second side together. 3. 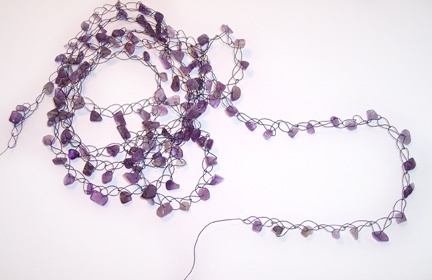 Cut a 20 inch piece of beading wire and attach it with a crimp close to one of the wrapping wires. 4. Thread on 5 bells and an oval bead, sliding them over the colored wires as well as the beading wire. Clip the ends even with the top of the oval bead. The bells will hang down a bit and cover the crimp. 5. String the rest of the beading wire as follows: 5 bells, 3 - 6mm amethyst rounds, 5 bells, a silver oval bead, 5 bells, 1 - 6mm amethyst round. 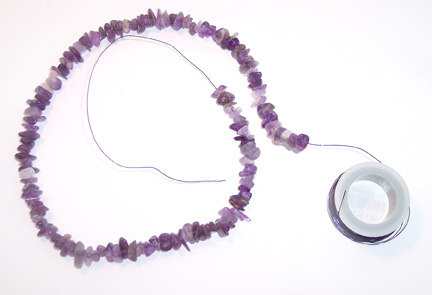 Add approximately 65 - 4mm amethyst rounds. Then reverse the pattern of bells, ovals, and 6mm beads listed above. 6. Anchor the free end of the beading wire close to the free ends of colored wire, using the second crimp. Clip all the free ends off at the top of the closest oval bead. 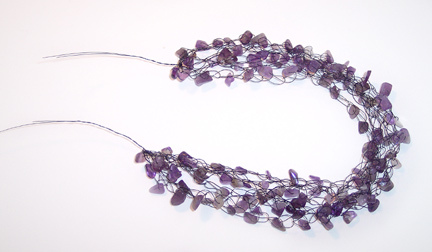 Oh that is so pretty and dainty I love amethyst and this is just so delicate looking very fey. Wow, it's something too unique with its design and so pretty.I love this piece which is so attractive with its elegant look. Very pretty! The color is just beautiful! This is gorgeous. Is there anyway that it can be adapted to knitting? That's a great idea, but I don't really know. I don't do much knitting, but maybe Viking knit or spool knitting would work! Hace muchos años elaboro en crochet me va bien,soy empírica. Es super tu paso a paso...felictaciones! Surprise package #2 from Cherry Tree Beads! It's the big button swap reveal day! Not Tucson, but New Jersey!